Suitsupply will soon open its first Boston shop on Newbury Street, according to CEO Fokke de Jong. Above: The Suitsupply store in Montreal. It’s been four years since Daisy Buchanan’s bar shuttered its location at 240A Newbury Street after 44 years in business. Now the space, which for years was a de facto clubhouse for some of the city’s sports stars (Derek Sanderson of the Boston Bruins was an owner), will become a lounge of a different kind. 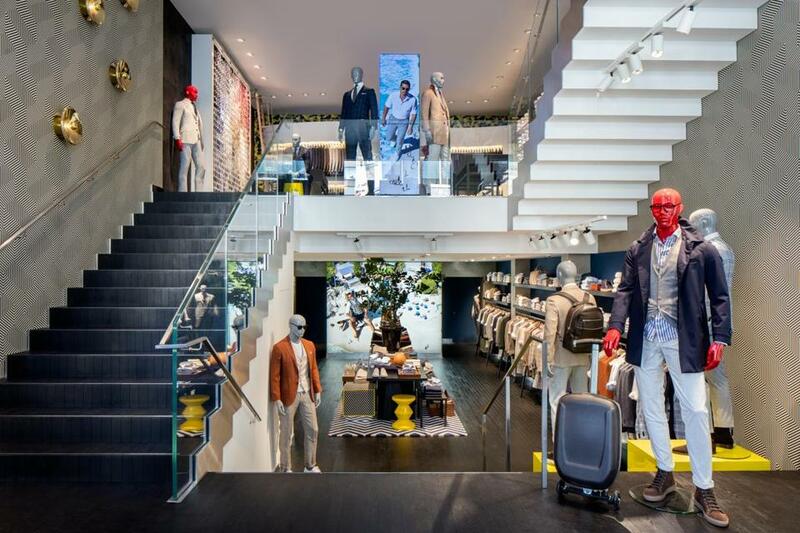 The European men’s fashion line Suitsupply will open its first Boston storefront at the address later this month, and will also operate a ground floor restaurant, Café Susu, at the location. The eatery, which includes an indoor space and patio seating, will serve coffee, juices, snacks, and have a full bar, said Fokke de Jong, the company’s chief executive. It will be the brand’s 100th store, and the first time that the company has experimented with a cafe, he said. Susu’s customers will have a view of the tailors as they do their alterations. The Dutch company started as a direct-to-consumer brand back in 2000, with de Jong selling his custom-made suits out of the trunk of his car. The brand has become something of a word-of-mouth success story, he said, known for its off-the-beaten path locations and competitive prices. The Wall Street Journal once did a blind side-by-side comparison between Suitsupply’s $600 suit and a $3,600 Armani suit and found them equal in quality. So it’s fitting perhaps that Suitsupply will be the Back Bay’s newest clothier to introduce a cafe concept, as it’s been more than a decade since Newbury Street’s iconic Armani Café shuttered. The store itself will be four levels, with the first floor devoted to a selection of off-the-rack items like casual dress jackets and linen shorts and pants. Suits will be be up a flight of central stairs, and the building’s top floor has been designed to accommodate a series of suites for made-to-measure fittings, de Jong said. Though the brand recently announced that it branching out with its women’s line, Suistudio, he said there are no plans to bring it to the Boston store. “It’s a different shopping experience,” he explained. Over 30 architects have been at work on the build-out for the past two years, but de Jong promises it will be worth the wait. “It’s going to be one of the most spectacular stores on Newbury Street,” he said.